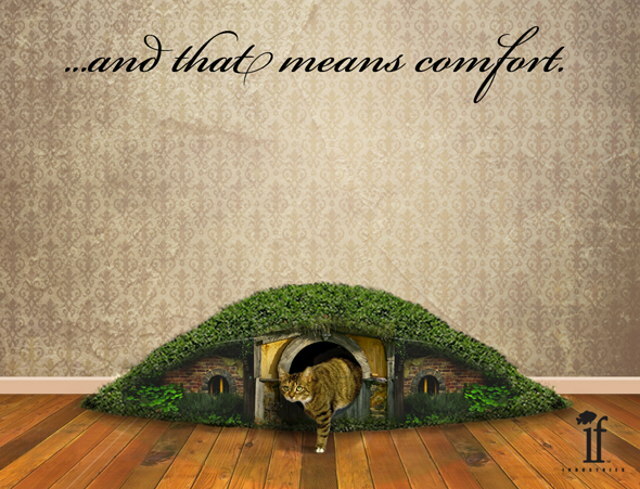 Hopefully this conceptual Hobbit Hole litter box comes installed with a Gandalf for cat constipation that hollers 'Thalt shall pass!'. "Hollers" did you hear that? Speakin' hip-hop. I tell you, things change when you get to the city. Kitty litter included. Hallloooo!!!! If I were the type to have cats...and that's a big if...I'd definitely want this. Only thing better would be a transporter pad to make the unmentionables disappear forever. Oooh. Or a sonic screwdriver that actually worked!!! That would revolutionize the industry. Anyway, great to see your type, friend. I'll second randomnerd on wanting to this if I was a cat; and of course you're damn right this would make a fun base or fort for the many action figures I have. It kinda' looks like a mossy, almost upside down base for the Legion of Doom if you squint hard enough doesn't? Hey folks - thanks for the warm welcome :) These last few weeks have been pretty manic and over 40degrees to boot, so yeah net-time kinda got lost in there somewhere! When you mentioned sonic screwdriver Random, I thought you were talking cocktails... now that would be a litter tray I'd want to move into - cat or not! Funny thing Dan, there is a drink called the Sonic Screwdriver. Pretty much yeah, on selective titles. But in all fairness Green Arrow really needed it, hopefully Lemire can keep the title going long enough from the dreaded cancellation bug. Glad youre back - myself, Ive spent three months from Sept to December moving to my new house, carrying things every day back and forth so I know whay its like. Ive only been in my new place for eight weeks myself. I knew it would be too good to go unused Random! Sounds dangerous too!